"Graphic Organizers can help readers focus on concepts and how they are related to other concepts. Graphic organizers help students read and understand textbooks and picture books." (Adler, C., 2015). A graphic organizer is a way to show concepts and relationship between concepts from a text using text, illustrations, and/or diagrams. There are a vast amount of graphic organizers and each one has its own unique purpose. Graphic organizers can be called maps, webs, graphs, charts, etc. Some of the main graphic organizers include Venn Diagrams, story maps, and KWL charts. (Adler, C., 2015). It is important to know that reading and writing go hand-in-hand. With that being said, graphic organizers are a great way to implement some writing into your lesson. Graphic organizers are also great tools to use in the writing process. Take a look at the video to the left, which describes what graphic organizers are in more detail and shows the benefits of using them in the writing process. How do Graphic Organizers Support Struggling Students? Another benefit of graphic organizers is that they can be used before, during, or after instruction. "Instead of focusing on teacher strategies, we should focus on student strategies for dealing with unfamiliar material in the absence of a supportive teacher who prefaces instruction with a focus on prior knowledge..." Jennings, J., & Lerner J & Caldwell, J., 2014). By using graphic organizers in your classroom you are teaching students a strategy that they should be able to use independently with texts once understanding and seeing the benefits of graphic organizers. Here is an example of how a teacher can incorporate graphic organizers into a broader assignment. The travel journal in this video shows graphic organizers inside and this is a great way to use them! Not only are they using graphic organizers in the travel journals, but they are also building comprehension! In reading classes you can use graphic organizers for many different reasons. In this lesson example, the teacher is using a graphic organizer to retell a story and help students gain comprehension of the story. The students took a portion of the chapter book in this lesson and used a four square graphic organizer to retell the story in their own words and create illustrations. In Mathematics, graphic organizers are very beneficial in organizing concepts. 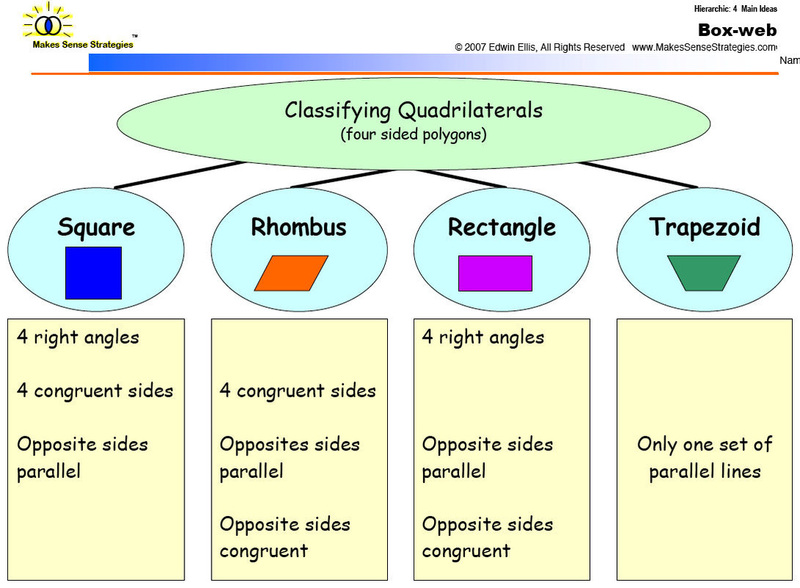 The example picture above shows a graphic organizer for categorizing quadrilaterals. It is very important you allow room for students to implement visuals as well in the graphic organizer like this one above. It will help the students distinguish the differences between each shape. In a science class you can use graphic organizers for new vocabulary, textbook content, and even hands-on science experiments. In this cause the lab is about which fruit has the most electricity. The graphic organizer helps students organize their process, the results, and the meaning behind the results. Something I would add to this graphic organizer is their thoughts and hypothesis at the beginning. This then gets the students thinking critically. Harton, J. (2014, January 17). How To Use Graphic Organizers. Retrieved October 2, 2015.